Tied Aid. Aid which is dependent on reciprocal benefits such as agreeing to buy goods and services from the donor country. Untied Aid. Aid given without any strings attached. Multilateral aid. Aid given from one country to an international organisation which is then distributed to a variety of different countries. For example, the Red Cross and Oxfam. Aid to poor countries is a controversial issue. Supporters argue targeted aid can help countries deal with natural disasters and improve infrastructure. Critics of aid argue that it can either encourage aid dependency or be misused and misdirected. The effectiveness of aid depends on how it is managed and how it is distributed. 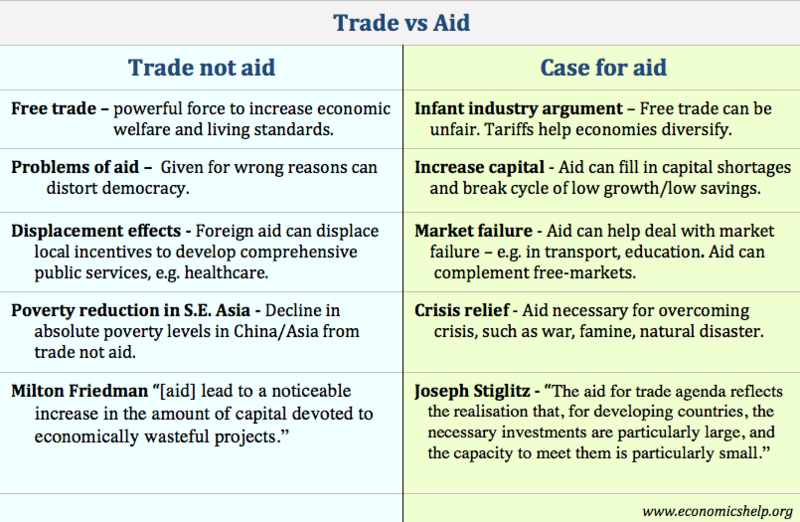 Critics of aid argue encourage trade is a more powerful way to increase economic welfare because this encourages self-sufficiency and is more sustainable in the long term.